Not the one from Walkabout, but the weird, pathetic quasi-pull shot he plays when he gets a short ball with two men on the fence. The one that’s twice cost him his wicket in this series and which near enough got him out on the two or three other occasions when he’s played it. We think this might be our favourite shot of this year’s Ashes. There are other contenders, of course. Michael Clarke alone has delivered a whole new batting textbook each innings. It’s hard to pick out one shot though as he’s rarely repeated one. He hasn’t usually had time. Peter Nevill’s leave is serving him well. While his middle order colleagues have been drawn to the ball in slow, easy-to-outwit fashion, like zombies towards brains, Nevill has been confident enough to leave the ball. At Edgbaston, he calmly left a James Anderson delivery which hit his stumps. Here at Trent Bridge, he did the same to a Ben Stokes ball but this time got his legs in the way. Shaun Marsh’s hard-handed push is a strong contender. His is the most zombie-like of all the hard-handed pushes and is further enhanced in our eyes by being played by a man whose batting we’ve long enjoyed. Executed perfectly, Marsh’s shot would end up in the hands of mid-off for no runs. 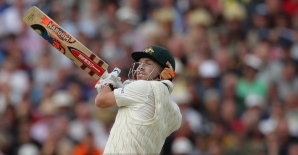 It is an unspectacularly pointless means of courting dismissal and yet it already feels like the inevitable full stop to each of his innings, like Shane Watson’s bat-around-pad lbw review preamble. But on balance, Warner’s non-pull is the winner, if only because it comes from a batsman who’s otherwise looked pretty decent. It’s an aberration, but he plays it so often, it can’t be. Warner’s spent time honing this gun-in-the-mouth-trigger-pull. It’s also spectacular. He doesn’t just spoon the catch to a legside fielder. He doesn’t just miss it. He somehow contrives to play the ball vertically while simultaneously looking camp as Christmas. Truly, it is a thing of rare, rare beauty. More of this kind of thing! Did England just win the 2015 Ashes? I’d just like to draw everyone;s attention to my comment on the following thread at 07:51 on 6th, just before this test started. Ben Stokes and all the wickets and the bowlings and them and that. Aaaah Ged, but see, you only had to wait a certain amount of time and another England bowler was going to put his hand up and start tearing this Aussie ‘batting’ line-up a new one, and it was definitely Stokesy’s turn. Michael Clarke’s first innings at Trent Bridge really was a thing of grotesque, unworldly beauty, btw. The Damian Hirst’s Mother and Child Divided of cricket innings. Here he is failing to use a chair. That’s not at all right, David! Come on, Howe. You’re just choosing the pictures that show him at his daftest. Chairy-picking, if you will. Will England improve in the second Test?